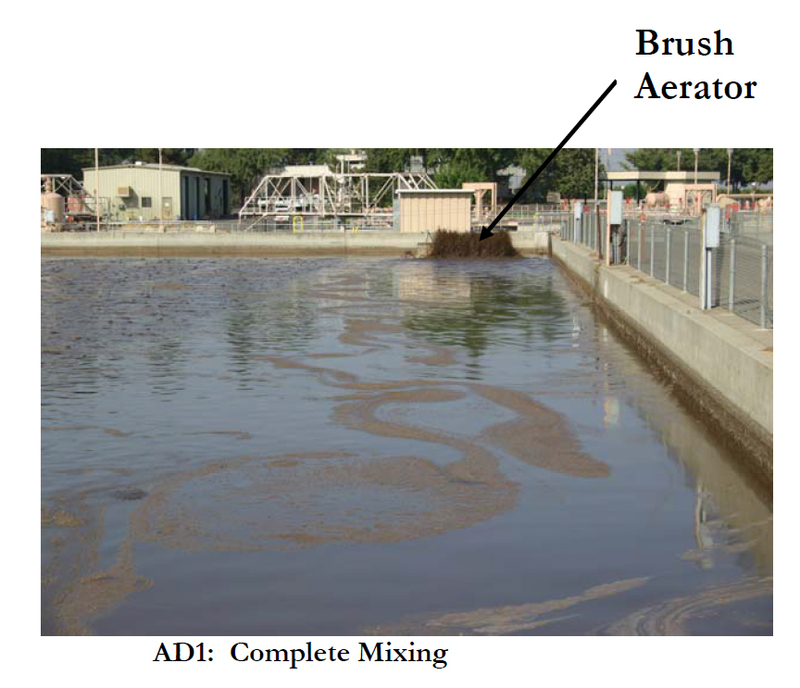 The objective of the brush aerator pilot study was to improve the mixing in aerobic digester 1 (AD1), which in turn enhances DO, and biological treatment, and replace the existing Landia and Flgyt mixers as a supplement to the existing coarse bubble diffusers. 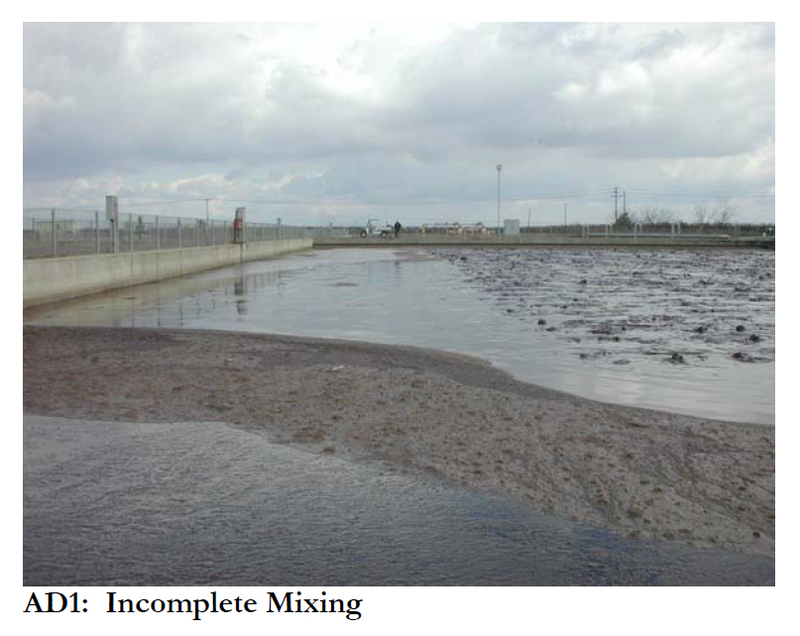 Also, better mixing provides the basin with more consistent solids in the sludge and more efficient dewatering. The issues with the existing mixers are (1) incomplete mixing of basin, (2) unreliable, (3)uneven distribution of DO (operating parameter of 0.5 to 1.0 mg/l) (4) no ease of operation or flexibility, (5) pH below operating parameter of 5.0 to 7.0 (6) odors, (7) high maintenance and chemical costs. The Operations Department monitored the DO in the basin. The DO was taken at six points around the basin within the first one foot of digester sludge. Readings were taken twice a day and recorded. The Operations Department will continue to monitor the DO around the basin. The DO results were consistent around the basin, an indication that the basin is completely mixed. Sufficient DO in the digester reduces the occurrence of offensive odors. It has been past practice to place a "mask it" around the basins to combat the odors from the digesters. The best method to combat odors is through eliminating the source. By complete mixing of the basin and providing sufficient consistent DO throughout the basin the use of "mask it" is decreased, chemical costs are decreased, and man hours in placing the "mask it" is decreased. Most importantly the potential for public complaints is decreased. The DO along with temperature affects the pH of digesters. 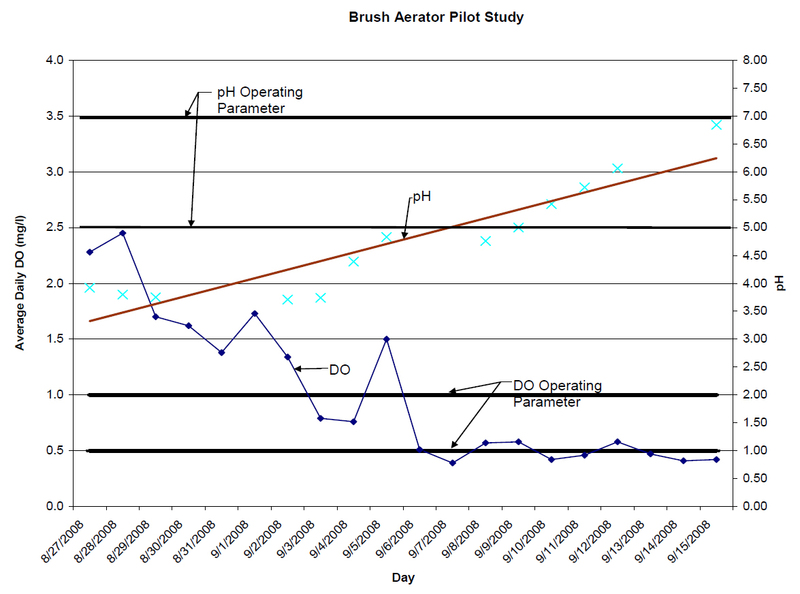 The pH results during the first week of operation of the brush aerator were low and out of the digester operational parameter. Operations made adjustments to the air flow to the coarse bubble diffusers to control the DO levels. Observations made by Scott Aguiar, Plant Operations Supervisor, indicate that there is an excess amount of air being supplied to AD 1 with the addition of the brush aerator and warrants further analysis. The attached chart shows the relationship between DO and pH. As the DO dropped closer to the operating parameter the pH rose to the appropriate operating parameter. The significance of low pH in the digester is that the biological organisms are adversely affected and digestion becomes inefficient. Prior to this study caustic soda and sodium bicarbonate would be added to raise the pH. Chemical was added on average every 15 calendar days beginning in late April through late August. Chemical costs for 2007 and 2008 were $29,812 and $21,146, respectively. It is anticipated that with the use of the brush aerators that the Brush Aerator 3 chemical costs would decrease by at least 50%. The last application of chemical was in late August about the same time as the installation of the brush aerator. The use of chemical is an inefficient method to control pH; pH should be controlled by the use of adequate equipment with proper operational control. The existing mixers did not supplement the coarse bubble diffusers sufficiently enough to provide complete mixing nor consistent DO throughout the basin; thereby the pH was consistently out of the operational parameter of 5.0 to 7.0. When sludge is digested it turns into water, gas, and volatile matter. For an aerobic digester the volatile reduction ranges from 45% to 70%1 . The reduction in volatile matter equates to a reduction in solids, easier dewatering, decrease in polymer use (centrifuge) increased efficiency of sludge drying beds, and cost savings for solids removal. See table below for a comparison of the volatile solids reduction from June 2008 to mid-September 2008. The benefits of the brush aerator are that it improves the mixing in AD1, which in turn enhances DO and biological treatment, provides the basin with more consistent solids in the sludge and more efficient dewatering, ease of operations and maintenance, provides operational flexibility, is reliable, cost savings in chemical, power consumption (two 10hp brush aerators vs. six mixers at 5hp each, in AD 1 and AD2), and solids being hauled fromthe site. The cost of each brush aerator is $15,000 and the cost of each Landia mixer is $12,500. See memorandum dated 9/10/08, Existing Mixer Maintenance and Brush Aerator Pilot Test Preliminary Information for the Landia and Flgyt maintenance history. Purchase four (4) brush aerators to replace 12 mixers for AD1 and AD2. Contact PG&E for potential rebates. Place DO sensors and associated PLC and programming for automation of the blower air flow. Phase II of the evaluation of the brush aerator and aerobic digester system is the optimization of the blower system. Due to the observations made by Operations it was noted that there is too much air provided to the digester system. The excess air was routed to AD2, which is currently out of service. The blowers do not have variable frequency drives, do not have a sufficient range of air flow, are not automated, and are not energy efficient. The PG&E energy audit report showed that 43% of the Districts energy consumption occurred in the processes associated with the aerobic digesters. 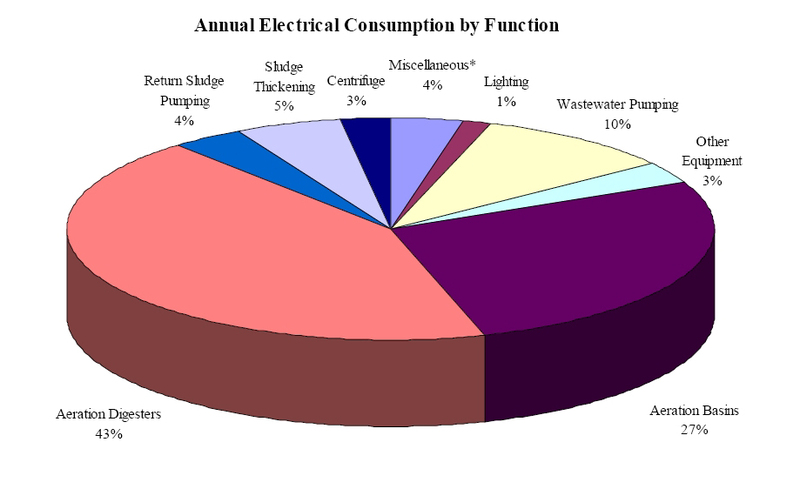 The chart below is excerpted from the Base PG&E energy report audit. The objective of the blower evaluation is to determine the air required to sufficiently add DO to the basin in conjunction with the use of the brush aerators, meet all regulatory requirements, ease of O & M, flexibility, efficiency, reliability, and reduce power consumption. The AD I and AD II Blower Evaluation, upon concurrence of the parameters should begin immediately with conclusions and recommendations to be completed in August of 2009.